Registered designs are sometimes overlooked in favour of their patent and trade mark cousins. However, the Federal Court’s latest decision on designs, which was handed down on 8 July 2016 in Hunter Pacific International Pty Ltd v Martec Pty Ltd  FCA 796, not only reminds us of the important role designs play as part of a comprehensive IP portfolio, but should also boost design owners’ confidence in those rights as a powerful tool to thwart imitators. Hunter held a registered design for a ceiling fan, and alleged that Martec’s fan, known as the Razor, infringed those rights. Annexed to the judgment is a useful comparative diagram, which we have reproduced below, which demonstrates the similarities and differences between the Martec product and Hunter’s design. The question for the court was whether the Razor was substantially similar in overall impression to Hunter’s design. 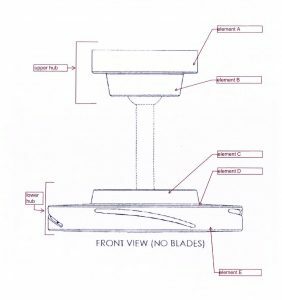 Despite noting a number of differences between the two designs, such as the Razor having a lower canopy that was absent from the registered design, and a different upper hub, the court ruled that the Razor was too similar to, and therefore infringed, the Design. Finding the expert evidence of a mechanical engineer who quantified the differences between the designs largely of no assistance, the Court stated that “precise mathematical comparisons or analyses of measurements or ratios have no role to play in determining whether or not the two designs create an overall impression that is substantially similar”. 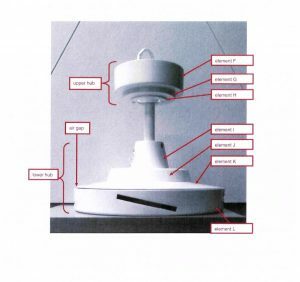 The Court also considered relevant how the designs would be perceived when their corresponding products were used as intended – in this case when installed into a ceiling, and being generally observed from a low angle. Although final orders have not yet been made, in many cases, a finding of infringement would result in the infringer being barred from continuing to sell its product in Australia, and being required to pay a sum of money to the design owner for any previous sales. This case demonstrates how registered designs are a powerful tool for preventing others from copying the appearance of your product. The exclusivity that comes with a registered design can provide you with a real market edge, particularly if consumers may be swayed by your product’s appearance. Importantly, it is very difficult to protect the look of a product with any other legal rights. Patents only protect how a product functions. Shape trade mark rights can be difficult to obtain and may only offer limited protection. Copyright for a design is generally not available where a design has been industrially applied. The court’s finding of infringement in Hunter v Martec, notwithstanding some clear differences between the designs, also suggests that the protection offered by registered designs is getting stronger, making them an even more powerful tool for innovators. While registered designs are the least-litigated of the mainstream intellectual property rights, this decision may give design owners a significant confidence boost, which could be the catalyst for an increase in litigation to enforce those rights. If you have a developed a stylish new product or you believe your product may, over time, become known for its distinctive design, you should consider taking advantage of the registered design system. Designs can be relatively quick and inexpensive to obtain, making them a worthwhile investment. It’s important to remember, however, that registered designs are only valid if they are new; accordingly, it is critical that you apply for your design before launching your product. Once the product is made public, design rights will no longer be available. It is also prudent to search for potentially problematic design registrations before launching your new product. As a full service provider, Wrays can advise you on whether a registered design will assist your business, prepare an application to register your design and help you enforce your registered designs against infringing third parties. If you’d like more information on designs, please contact Wrays.